Everyone wants a weekender, right? A place they can slip off to. Whether it would be located at the beach, the mountains, the lake, the woods or wherever; the important thing is that it is a place of rest and rejuvenation. A place to nourish ones inner nature. It is a Home that replenishes the soul. For me, a Home in this setting would have a completely different feel than a primary residence. Its scale and size would relate to a more casual and relaxed pace. It’s warmth is what becomes endearing and routinely draws you back. Without a doubt, I would certainly desire for it to be polished and refined, but, clean and simple would be the over-riding name of the game. This one certainly casts an indelible impression; and yet, I have found writing about it to be a bit of a challenge. You see most of the projects I like to spotlight are chock full of details and are honestly relatively easy to be descriptive about. This one; however, is somewhat understated. The design is not overly complicated. And the elements lean toward the side of being simple. Please do not take this as a disrespectful statement in any shape or fashion. Simple is one of the core principles to establishing elegance. And creating, implementing and executing a simple design can often be the most difficult to pull off. The kitchen definitely has some wonderful features like the marble counters, top-of-the-line appliances and spectacular windows, but, I think what attracts me so much to this one is the composition. It always comes down to the integrity of the composition. 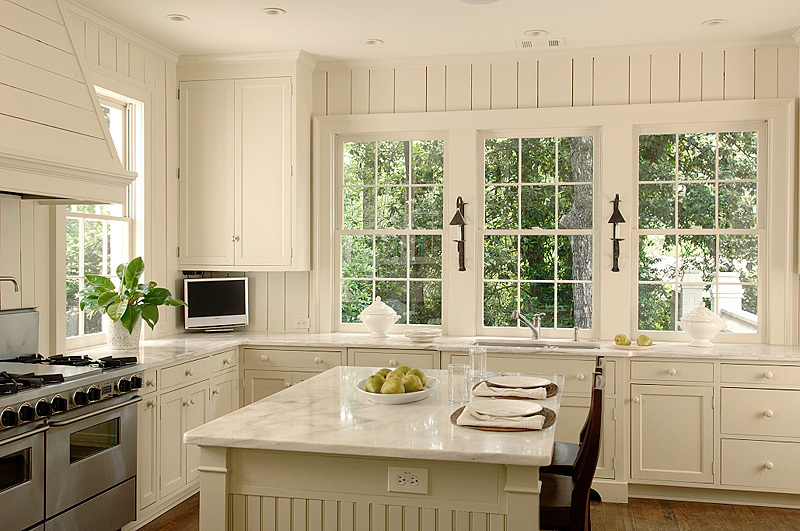 There is no denying that the kitchen is bright and open. This place is absolutely flooded with natural light. The connection to the outside is so strong that I know I would enjoy being here even if it were raining like mad out there. 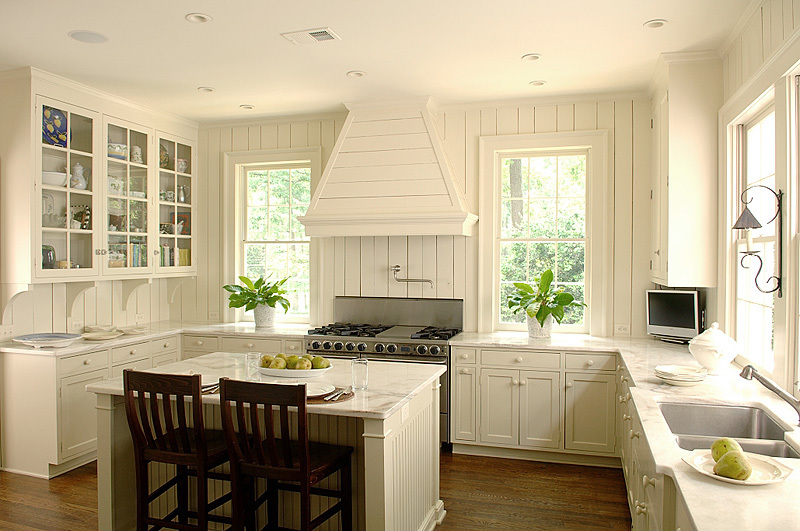 When looking around the room, the detailing and lines present themselves in a crisp and clean manner. Something that I love. And the placement of everything is very well-balanced. All of this comes together in a unified whole contributing to a space that is also incredibly comfortable. Morning coffee at the island would be a pure delight and time with the family would be nothing less than captivating. I know my words have probably fallen short here, but, I hope the images have picked up the slack.